BACKGROUND AND PURPOSE: In patients with ischemic stroke, not only the degree of ischemia but also its duration are key determinants of tissue survival. The purpose of this study was to show the synergistic effects of these two factors on tissue survival in humans. METHODS: We retrospectively reviewed findings in 19 patients with middle cerebral artery occlusion who had clearly defined ischemic duration from onset to angiographic complete recanalization and who underwent pretreatment single photon emission CT. Pretreatment single photon emission CT and final CT scans were compared, and hypoperfusion cortices were divided into reversible and irreversible ischemia. Regions of interest were placed in both irreversible and reversible ischemic cortices, and the residual cerebral blood flow was analyzed by side-to-side comparison with a calculated asymmetry index. To show the relationship between the reversibility of ischemia and the ischemic duration/severity, discriminant analyses were conducted. The analyses were conducted separately using data obtained within 3 hours of ischemic duration and data obtained more than 3 hours after ischemic duration. RESULTS: Within 3 hours of ischemic duration, analysis revealed a discriminant line of asymmetry index (%) = 21.53 time (h) − 19.15. After more than 3 hours of ischemic duration, it revealed a discriminant line of asymmetry index = 0.50 time + 48.27. These discriminant lines rose rapidly within the first 3 hours after stroke onset and thereafter reached almost a plateau level. CONCLUSION: These pilot data suggest urgency for treatment, less need for triage based on cerebral blood flow measurement during the first few hours, and more time to triage based on cerebral blood flow measurement for patients with later presentations. Recently, reperfusion therapies have been widely administered to treat acute ischemic stroke (1–6). When considering reperfusion therapies, proper patient selection is one of the most important issues to minimize hemorrhagic complications and to maximize recanalization efficacy. For patient selection, it is of great value to evaluate reversibility of ischemia, which may be determined not only by the duration of ischemia but also by its severity (7, 8). A time-threshold curve, which shows a serial change of infarcted flow threshold during the ischemic period, may be very useful for patient selection for reperfusion therapies. This concept was reported for the first time in 1981 by Jones et al (9) who used an awake monkey model. They showed an infarcted flow threshold rising over 3 hours to plateau at approximately 17–18 mL/100 g/min. A recent clinical study using single photon emission CT (SPECT) has also shown an infarcted flow threshold rising over 5 hours to plateau at approximately 55% of cerebellar flow (10). However, these time-threshold curves were not derived from statistical analysis. We present the first study designed to gain a statistically analyzed time-threshold curve in humans with acute ischemic stroke. We investigated the relationship between the reversibility of ischemia and the ischemic duration/severity using SPECT in patients with middle cerebral artery (MCA) occlusion who had clearly defined ischemic duration. Between August 1994 and March 1999, 108 patients with acute MCA occlusion were admitted to our hospital. Among them, 76 patients who had no apparent CT hypoattenuation related to the ischemic events, and for whom we had informed consent, were treated with intra-arterial reperfusion therapy. For 45 of the 76 patients, we conducted urgent SPECT studies to obtain pretreatment cerebral blood flow (CBF) measurements. Among the 45 patients, 19 had clearly defined ischemic duration from symptom onset to angiographic complete recanalization and were selected for this study. For all patients, complete recanalization was confirmed by using post-therapeutic angiography. Ischemic duration was defined as the time from symptom onset to angiographic complete recanalization. Inclusion criteria for reperfusion therapy consisted of the presence of major arterial occlusion consistent with clinical symptoms, absence of apparent CT hypoattenuation related to the ischemic events, and availability of informed consent from the patient or a family member. Our methods of reperfusion therapy have been previously reported (3, 11). Briefly, direct percutaneous transluminal angioplasty was performed in patients with M1 trunk occlusions with involvement of the lenticulostriate arteries. Angioplasty was performed with a Stealth angioplasty balloon catheter (Boston Scientific, Quincy, MA) with a maximum diameter of 2.0–2.5 mm. In cases of partial recanalization by direct percutaneous transluminal angioplasty, subsequent intra-arterial thrombolytic therapy was administered by using tissue plasminogen activator. Local intra-arterial thrombolysis was performed in patients with M1 trunk occlusion without lenticulostriate artery involvement and in patients with occlusion of the MCA divisions or branches. The 19 patients consisted of 11 men and eight women aged 49–86 years (mean, 69.7 years). Pretreatment angiograms revealed M1 trunk occlusion in 14 patients and occlusion of the MCA divisions or branches in five. Direct percutaneous transluminal angioplasty with intra-arterial local thrombolysis was performed in 10 patients. Direct percutaneous transluminal angioplasty without thrombolytic agents was performed in three patients. Intra-arterial thrombolysis with tissue plasminogen activator was performed in six patients. Native tissue plasminogen activator (7.2 mg of tisokinase; Asahi Chemical Industry Co., Japan) was used for thrombolytic therapy. The time from symptom onset to reperfusion ranged from 2.5 to 8.0 hours (average, 4.1 hours). The details of residual CBF measurement with SPECT were reported previously (12). In brief, 20 mCi of technetium-99m-N,N′-(1,2-ethylenediyl) bis-l-cysteine diethylester was injected just before thrombolytic therapy and SPECT scanning was performed just after treatment. The applied SPECT scanner was a dual-headed gamma camera system (OPTIMA; GE-YMS, Tokyo, Japan) with high resolution collimators. SPECT acquisition was performed in 64 steps (360° with a 128 × 128 matrix). Transaxial images were reconstructed by filtered back-projection by using both Butterworth and ramp filters with attenuation correction. From 12 axial sections for each patient, all sections with hypoperfusion cortices in the MCA territories were selected. For topographical definitions, pretreatment SPECT and CT scans obtained 3 months after stroke were compared by means of computerized coregistration. By using the CT template of MCA territories reported by Damasio (13), regions of interest of 2 × 2 cm2 were placed in the hypoperfusion cortices in the MCA territories and the contralateral homologous region. One or two regions of interest were placed on the hypoperfusion cortices stereotactically in each section. The number of regions of interest in each patient ranged from 12 to 28 depending on the size of hypoperfusion area. Hypoperfusion cortices that experienced infarction and then complete recanalization were defined as irreversible ischemic cortices. On the other hand, hypoperfusion cortices that escaped infarction and then experienced complete recanalization in the occluded MCA territories were defined as reversible ischemic cortices (12). The residual CBF of both the irreversible and reversible ischemic cortices was evaluated semiquantitatively by calculating the asymmetry index (AI) (12, 14–16). The AI was calculated as Ca/Cb × 100 (%), where Ca represents the mean reconstructed counts for the ischemic cortices and Cb represents those for the contralateral homologous region. To show the relationship between the reversibility of ischemia and the ischemic duration/severity, we conducted discriminant analyses of these data using SAS software (SAS Institute, Cary, NC) on a Macintosh computer. The analyses were conducted separately using data obtained within 3 hours of ischemic duration and those obtained after 3 hours of ischemic duration to gain more insight into the meaning of these data. Final CT scans obtained 3 months after onset revealed focal cortical infarction in seven patients. At 3 months after onset, 11 (58%) patients had fully recovered without neurologic deficit. Six (32%) patients had partially recovered with self-care. The other two patients experienced no neurologic change after treatment (Table). We evaluated the SPECT studies that had 20 regions of interest in the irreversible cortices in seven patients and 107 regions of interest in the reversible cortices in 19 patients. 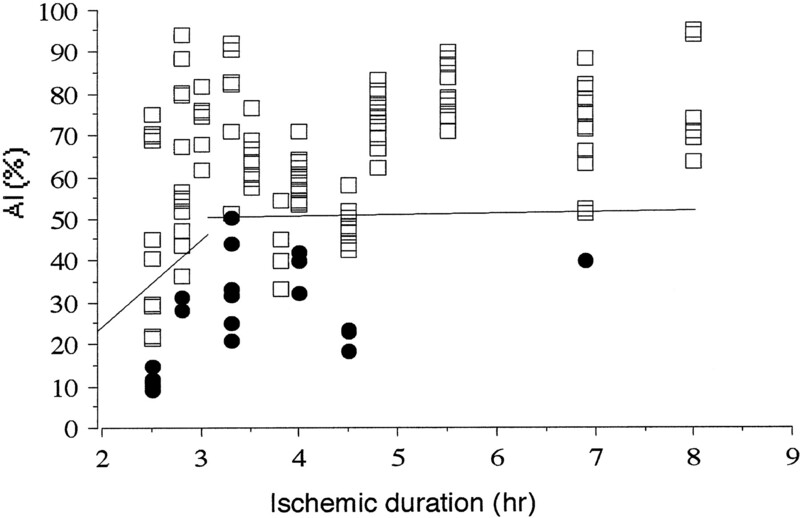 The relationship between the reversibility of ischemia and the ischemic duration/severity is illustrated in Figure 1. Within 3 hr of ischemic duration, a discriminant line of AI (%) = 21.53 time (h) − 19.15 (n = 35) was obtained and there were six (17%) falsely discriminated ischemic lesions. On the other hand, after 3 hours of ischemic duration, a discriminant line of AI = 0.50 time + 48.27 (n = 92) was obtained and there were 10 (11%) falsely discriminated ischemic lesions. Graph shows relationship between outcome in tissue regions that were successfully reperfused and ischemic duration/severity. Plots of AI (%) of irreversible (•) and reversible (□) lesions versus ischemic duration are shown. A discriminant line of AI (%) = 21.53 time (h) − 19.15 (n = 35) within 3 hours of ischemic duration can be seen. There are six (17%) falsely discriminated ischemic lesions. A discriminant line of AI = 0.50 time − 48.27 (n = 92) after 3 hours’ ischemic duration can be seen. There are 10 (11%) falsely discriminated ischemic lesions. Case 9, a representative case, involved a 65-year-old man who presented with sudden onset of left hemiparesis. 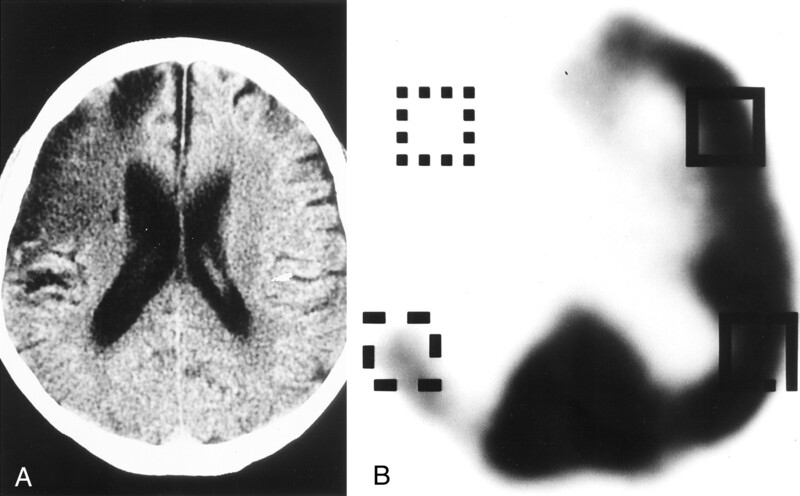 A CT scan obtained at admission revealed old infarct in the left occipital lobe and the absence of early CT findings related to this ischemic event. Angiography showed complete occlusion of the right M1 trunk with involvement of the lenticulostriate arteries. Direct percutaneous transluminal angioplasty was performed by using a 2.0 × 1.5 mm Stealth angioplasty balloon catheter inflated twice to 2 atm for 30 seconds. Angiography performed after reperfusion therapy revealed complete recanalization of the MCA. The time from symptom onset to reperfusion was 2.5 hours. Although complete recanalization was achieved during the early phase of ischemic stroke, a follow-up CT scan obtained on the 90th day after onset revealed that an infarct occupied approximately half of the right MCA territory. The posterior half of the MCA territory escaped cerebral infarction (Fig 2A). SPECT scans revealed severe hypoperfusion in the anterior half of the MCA territory that experienced infarction, with an AI ranging from 9.33 to 14.89 (n = 5; average, 11.35), whereas mild hypoperfusion in the posterior half of the MCA territory escaped infarction, with an AI ranging from 69.04 to 75.26 (n = 4; average, 71.29) (Fig 2B). The patient had persistent left hemiparesis. A, Final CT scan shows that an infarct occupied approximately half the right MCA territory. Posterior half of the MCA territory escaped cerebral infarction. B, SPECT scan shows severe hypoperfusion with an AI of 14.89 in the anterior half of the MCA territory, which experienced infarction, and mild hypoperfusion with an AI of 70.82 in the posterior half of the MCA territory, which escaped infarction. Our present study is unique in that it provides statistically analyzed discriminant lines between reversible and irreversible ischemia, which may be substituted for time-threshold curves. We observed two discriminant lines: within 3 hours of ischemic duration and after 3 hours of ischemic duration. We chose a 3-hour cutoff point because it is the shortest therapeutic time window among randomized clinical trials that have studied the efficacy of thrombolytic therapy in patients with acute ischemic stroke (1, 2, 5, 17–21). Within the first 3 hours, the discriminant line rapidly rose to 45.5% of contralateral presumed normal CBF. Thereafter, it very gradually rose from 49.8% to 52.3% of contralateral presumed normal CBF between 3 and 8 hours, which was the end of this study period. Our present study could not provide an absolute continuous time-threshold curve because of variable reversibility of the ischemic tissue, even in cases of the very same duration and severity of ischemia. This is partly because of the variety of pathophysiological states (22, 23) and partly because of the semiquantitative analysis of SPECT data. In SPECT studies, absolute values of CBF cannot be determined; calculation of the counting-rate ratios for ischemic lesions with respect to presumed normal regions enables semiquantitative analysis of CBF values (16). Ueda et al (10) showed an infarcted flow threshold rising over 5 hr to plateau at approximately 55% of cerebellar flow using technetium-99m hexamethylpropyleneamine oxime. Although the radiotracer and reference for normal CBF used in our study are different from those used in the study presented by Ueda et al, the plateau level of our time-threshold curve is similar to theirs. Although the development of infarction is too complex to be described by a simple threshold concept, that concept is useful for the management of acute ischemic stroke (9, 10, 24, 25). To render our time-threshold curve easy to use for making a decision regarding reperfusion therapy, the equation should be corrected as T (h) = 0.046 AI (%) + 0.889 within 3 hours. When a patient is admitted within 3 hours after onset, the therapeutic time window can be calculated using the data of AI and the above equation. On the other hand, sufficient residual CBF of >50% to 55% of contralateral normal CBF may be required for successful recanalization when a patient is admitted more than 3 hours after onset. From the discriminant line with steep acclivity within the first 3 hours, a delay for a moment in reperfusion may result in enlargement of the irreversible tissue. More urgent initiation of reperfusion therapy may result in more favorable outcomes for patients within the first 3 hours after onset. Therefore, we begrudge even the time needed for CBF measurement before reperfusion therapy; this line of thinking is similar to the exclusion of CBF evaluation for patient selection in the National Institute of Neurological Disorders and rt-PA Stroke Study (5). On the other hand, when the ischemic duration is more than 3 hours after stroke onset, the near plateau of our time-threshold curve suggests the possibility of triage based on CBF measurements. We are planning to conduct a prospective clinical trial to investigate the usefulness of this time-threshold curve determined by SPECT in patient selection for reperfusion therapy. We have shown statistically analyzed discriminant lines between reversible and irreversible ischemia. The discriminant line rapidly rose to 45.5% of contralateral presumed normal CBF within the first 3 hours after stroke onset (AI = 21.53 time − 19.15), which suggests urgency for treatment and less need for triage based on CBF measurements. However, when pretreatment CBF measurements are obtained, the corrected equation [T (h) = 0.046 AI (%) + 0.889] may be feasible for calculating the therapeutic time window. Thereafter, it very gradually increases from 49.8% to 52.3% of contralateral presumed normal CBF between 3 and 8 hours (AI = 0.50 time + 48.27), which suggests the possibility of triage based on CBF measurements. These lines may be substituted for time-threshold curves and may be feasible in patient selection for reperfusion therapy. Accepted after revision December 3, 2001.